Making extra money is something that a lot of people want to do. Whether they are paying off debt or saving for a trip, extra money comes in handy from time to time. In the past, I’ve discussed different ways to make extra money doing things like blogging or selling stuff on eBay. Today, I want to go over five part-time jobs that you can do to make extra money. The first job that you can do to make extra money is to become a restaurant server. If you have a 9-5 gig, working on the weekends at a restaurant will be perfect for you. Weekends are usually the busiest time at most restaurants anyway, so you can probably make close to $100 a shift. If you work at a top tier restaurant, you may be able to bring in close to $300 each day. The next job that will help you make extra money is to become a car valet. This is another job that can be done on the weekends or weeknights after work. Valets get paid by the hour plus they earn tips. The amount of money that you can make depends on where and who you’re valeting for. Certain hotel brands may be good to work for. The third job on the list is to become a bartender. If you know your alcohol and know how to mix drinks, you will always be able to find a part-time job. I have several friends who have been bartenders over the years. They can make hundreds of dollars on Friday and Saturday nights. If they decided to do private events, they could make even more money. 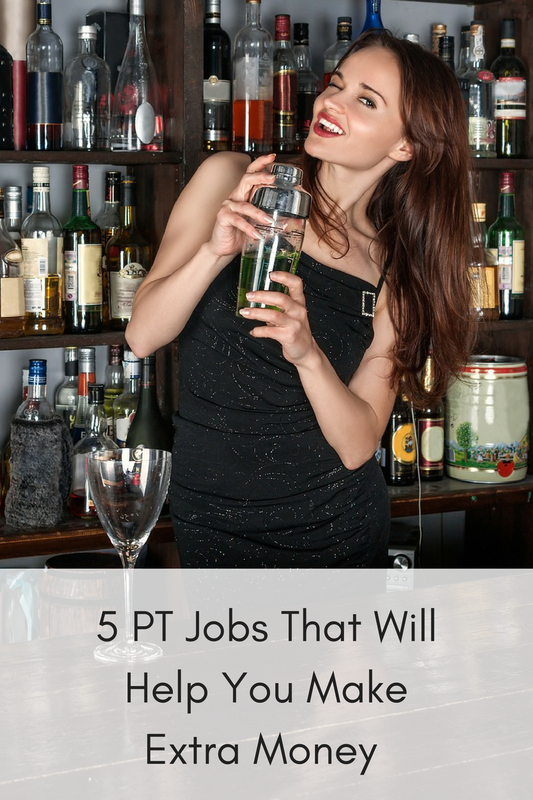 The better the drinks are, the more tips that the bartenders can get. Working retail is the fourth job on the list. Many retailers are flexible with their hours, so they allow some people just to work on weekends. Retail positions are very popular around the holiday season. Those businesses are looking for as much help as they can get. I’ve worked retail as a part-time job before. While you won’t make as much as you can as a server or bartender, it’s still a very easy job. Driving part-time is the last thing on the list. It’s not technically a job, but you can make a lot of money driving part-time with Uber or Lyft. I have a friend who used to drive for Uber. She would make about $300 a week driving for them part-time. That’s not bad for working 15-20 hours each week. Those were five jobs that you can do to make extra money. There should be no complaining if you are making enough cash at your full-time position. There are options out there for you to earn more. Some of these jobs may pay more than others, but you should find one that you like. Figure out which one works for you and start bringing in this extra money. What have you done to make extra cash? I’ve done a lot of side jobs — waiting tables, selling beer at NFL games, working as a runner or production assistant for a concert. Now, I’m more focused on blogging, freelance writing, social media consulting, and brand ambassador gigs.